Daytripper: Hanging with Huck Finn in Hannibal, Mo. The Mark Twain Boyhood Home & Museum contains unique Clemens family artifacts. 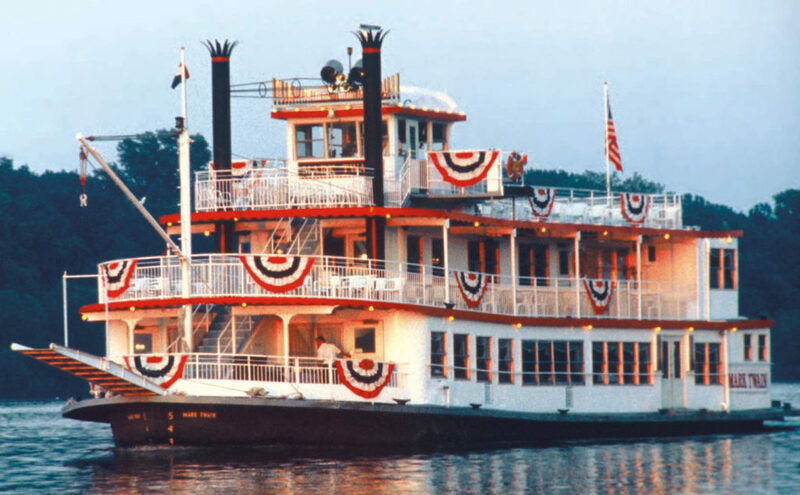 Cruise down the mighty Mississippi on the nostalgic Mark Twain Riverboat in Hannibal. 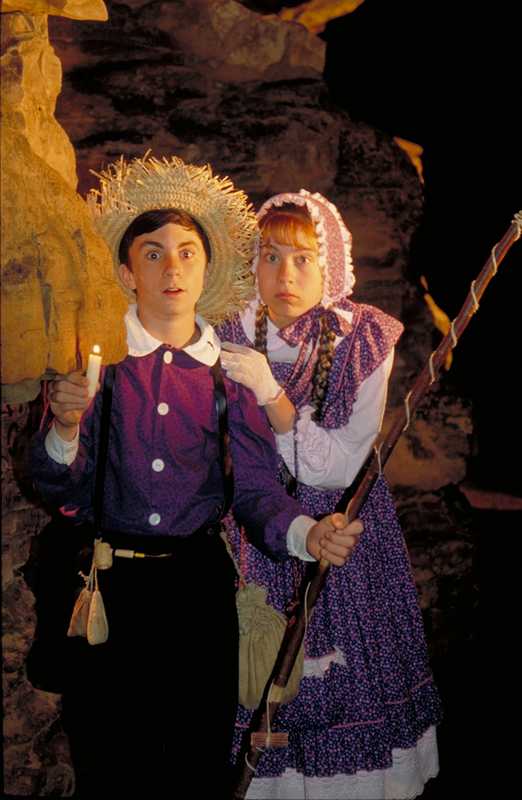 Mark Twain’s stories about Tom Sawyer and Becky Thatcher come alive in Mark Twain Cave. In Hannibal, Mo., you’ll find the spirit of Mark Twain, who penned the classics “The Adventures of Tom Sawyer” and “Adventures of Huckleberry Finn,” is very much alive. Hannibal’s most famous son, Samuel Langhorne Clemens, used a variety of pen names throughout the years, including Thomas Jefferson Snodgrass, before finally settling on Mark Twain, which is a riverboat term measuring two fathoms (12 feet) in depth. In Clemens’ day, that depth meant “safe water” for riverboats. Today “Mark Twain” is famous not only for his books, but also for his pithy quips on just about every subject imaginable — you can see some of these witty quotes in The Mark Twain Boyhood Home and Museum. When Sam was four, his family moved to Hannibal from his birthplace of Florida, Mo. (about 30 miles southwest), and lived there until he was 17. Many of the colorful characters featured in Sam’s novels were based upon people Sam knew while growing up in this scenic river town, and many of the events in his books were based on his boyhood escapades, so Hannibal was where all the beloved stories started. And what better education could the budding literary genius have gotten than growing up in a place rife with jumping frogs, romantic-looking riverboats and dark, mysterious caves? Throw the dead body of a murdered man into the mix — Sam once woke up on the floor of his father’s office to find himself lying next to the corpse — and it’s no wonder the young author’s imagination later ran wild. The character Becky Thatcher was based upon Sam’s childhood sweetheart, Laura Hawkins. The Becky Thatcher House, currently under renovation, is scheduled to reopen later this year, and you can also visit Becky’s Old-Fashioned Ice Cream Parlor and Emporium on Main Street for a variety of sweet concoctions during the summer. Start your visit to Hannibal at the Mark Twain Museum Interpretive Center, which contains interactive exhibits that fascinate youngsters as they follow young Sam on his rambles around Hannibal. It’s particularly interesting to see which of the town’s places he later transformed into stories. The Huckleberry Finn Home is a reconstruction of the Blankenship family’s cabin. Young Tom Blankenship was Sam’s neighbor and partner in mischief-making, and the inspiration for the character of Huck. Nearby you’ll find a gift shop selling old-fashioned toys, card games (great for the car ride back to Lawrence), dice games, Jacob’s ladders, kits for making old-fashioned clothespin dolls and a wide variety of Mark Twain books. You can also go inside the Justice of the Peace office where Sam’s father, John Marshall Clemens (who inspired the stern character of Judge Thatcher) practiced law, and where scenes are now set up from Mark Twain’s Life on the Mississippi, depicting the aforementioned dead body incident. Jane Clemens, Sam’s mother, was the model for Aunt Polly, the woman who once ordered young Tom Sawyer to whitewash a fence as punishment for his pranks. Today, “Tom Sawyer’s fence” stands freshly whitewashed in Hannibal’s historic district, on the western banks of the Mississippi River. 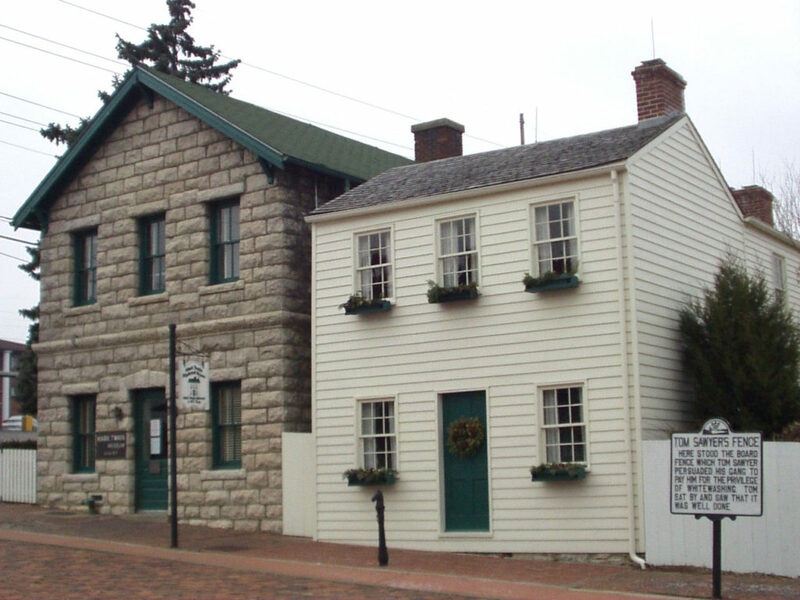 A visit to Hannibal is not complete without checking out the Mark Twain Museum Gallery, with hands-on exhibits for kids, including a riverboat’s wheel that you can steer and a steamboat whistle that lets out a mighty sound when you pull on the rope; artifacts, like Twain’s white jacket, Oxford gown, top hat, pocket watch and pipe; and 15 original Norman Rockwell paintings of Tom and Huck. There’s also the Mark Twain Cave, where Sam found bats to take home to his unappreciative mother; the Mark Twain Riverboat, in operation April through October; and the many unique shops, art galleries and restaurants along downtown Main Street.